Political parties on Monday expressed condolences over the death of opposition lawmaker Roh Hoe-chan, who jumped from an apartment building earlier in the day amid a probe into allegations that he took illegal political funds. Roh, 62, floor leader of the minor opposition Justice Party, was a towering figure in the nation's labor movement and progressive politics. He was widely popular for his pithy sound bites and sharp criticism against the corrupt establishment. His image was tarnished recently as the prosecution investigated allegations that the three-term lawmaker took 50 million won ($44,333) from an aide to a power blogger, known by the nickname Druking, who is at the center of an online opinion rigging scandal. 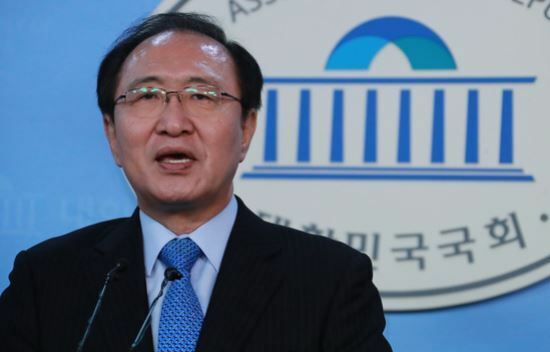 "He is the symbol of progressive politics in Korean history as he has made efforts for progressive politics since the early 1990s," Back Hye-ryun, spokeswoman of the ruling Democratic Party, said in a statement. "Politicians who have supported him will respect the values of the progressive democracy that he has pursued," she said. The main opposition Liberty Korea Party said that parties should continue Roh's aspirations for political reforms and development. "He set an example as a politician who cared for ordinary people and workers. The death of Roh, who was beloved by people for his piercing remarks, is a tragedy for Korean politics," the conservative party said. "No words can express the sadness over his death," the Justice Party said. It called an emergency meeting later in the day. Roh recently visited the United States with his counterparts from other parties as part of parliamentary diplomacy aimed at promoting the country's security and economic agenda. The floor leaders of the rival parties were supposed to hold a meeting Monday morning to discuss ways to promote parliamentary cooperation, but they hastily canceled it over Roh's death. Roh had denied the allegations against him at a press briefing with Korean correspondents in Washington. In a suicide note, he said that he took money, but it had nothing to do with illicit favors.